Siblings Against Drugs is an organization dedicated to helping the siblings of individuals addicted to drugs. SAD "reminds brothers and sisters of drug addicts that it's not their fault their sibling has the disease of drug addiction." This website is another product of my partnership with Celia Stratton of Landam Design Works. As always, Celia came up with a great design and I sliced and diced it up into the site you see today. The site itself is still a work in progress as of this writing, but I'm looking forward to adding lots more great content in the near future. 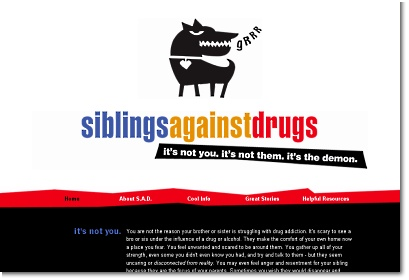 SiblingsAgainstDrugs.org was created using plain 'ole HTML and CSS. Any client-side stuff was done using JQuery.